The Indigo Hours | Beauty & Lifestyle: How Long Does My Skincare Routine Take? How Long Does My Skincare Routine Take? How long does your evening skincare routine take? Do you have any idea? I took a guess, before timing myself, of around ten minutes; I enjoy my evening routine so how long it takes has never been of much concern to me! I know that's not the case for everyone, though, and having seen Laurzrah's post on how long her skincare routine takes, I thought this would be a fun twist on sharing my current skincare routine. I've based this on a regular day when I'm wearing a full face of make-up. 00:40 Remove make-up; Garnier Micellar Cleansing Water | I always start by removing the bulk of my make-up, usually with a micellar water on a cotton pad, as it's quick and easy! If I'm wearing waterproof or particularly stubborn mascara, this is the point at which I'd use an eye make-up remover, but I don't use a separate one of a day-to-day basis as I find it's unnecessary. 03:03 First cleanse; Bee Good Honey & Propolis 2-in-1 Cream Cleanser | My first cleanse tends to be either a cream, oil or balm-based cleanser, as I find these work really well for me to break down the last of my make-up and give my skin a really good clean without leaving it irritated or dried-out. I usually massage into dry skin first, then dampen my hands and repeat, before polishing off with a muslin cloth or flannel wrung out in hand-hot water. I prefer flannels as they hold the heat a little better, but I do use a mixture of both, using a clean cloth each day so I'm not rubbing yesterday's bacteria and make-up back onto my face. 01:49 Second cleanse; Murad AHA/BHA Exfoliating Cleanser or Malin & Goetz Grapefruit Face Cleanser | For my second cleanse, I usually go for a gel-based cleanser, which I can massage into damp skin and rinse off, to be sure that my skin is completely cleansed of the day's make-up, dirt, oil, and the first cleanser. 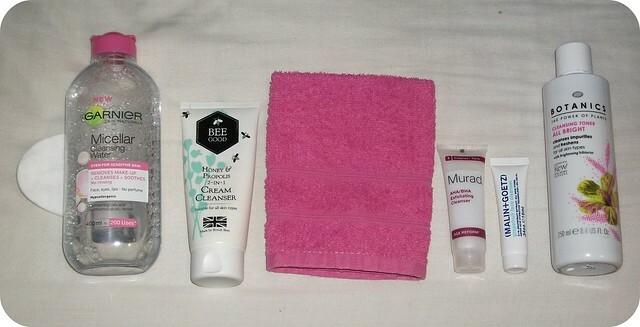 I'm currently using up some sample-sized products; I really like the Murad cleanser, although I think it'd be a bit much for everyday use - I use this two or three times per week. I use the Malin & Goetz one on the in-between days and it's equally lovely; it smells incredible and works nicely. 00:37 Tone; Boots Botanics All Bright Cleansing Toner | I don't honestly know whether this does anything to brighten my skin or not, but I do really like it; it's a budget-friendly option that fits nicely within my routine. This is my second bottle and it's almost empty, so I'm considering trying something new - it might be time to buy a full-sized bottle of Pixi Glow Tonic! 00:34 Treat; Merumaya Concentrated Spot Treatment | I just dab this on any active blemishes; it takes literally seconds to dry on my skin before I moisturise, and I've found it incredibly effective in reducing the time it takes spots to heal. 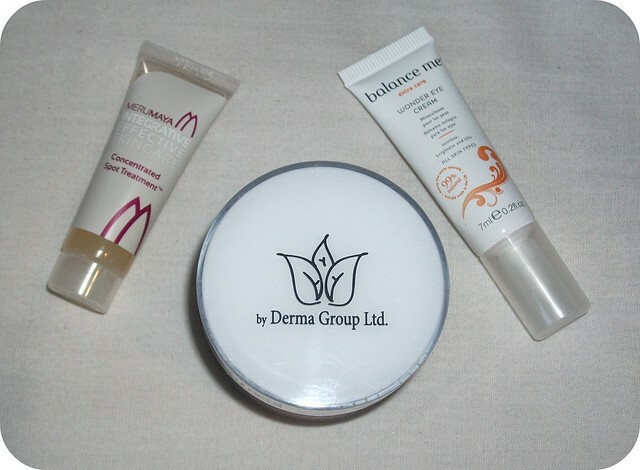 01:05 Moisturise; Balance Me Wonder Eye Cream & Acne Ultra Clear Cream | I raved about the Balance Me eye cream in my review, and indeed it's the only one I've ever used consistently; I find it works really well to sooth dryness, hydrate and refresh my eye area. The Acne Ultra Clear Cream is a moisturiser with natural blemish-fighting ingredients; I haven't found it to stop me getting spots entirely, but it does seem to have reduced their numbers and helps with healing time. It also smells like cinnamon! Total: 07:48. So, I wasn't too far out with my estimate of ten minutes! 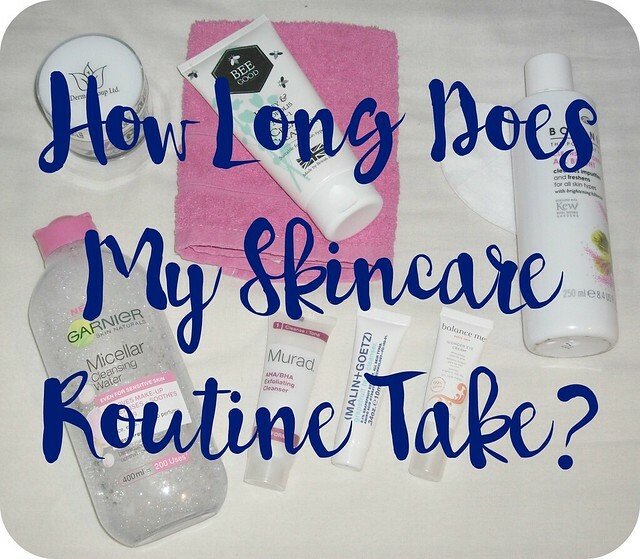 Do you know how long your skincare routine takes? I think I need to check out the Balance Me Wonder eyecream, I have the driest eyelids and nothing seems to me able to moisturise them. Thanks for sharing your routine! My nighttime routine is usually around 10 minutes as well, though lately it's been shorter since I can't use half my products during pregnancy. That Garnier Micellar water is now available in the states though, so I'm so excited to give it a try! Such a lovely post! I take around 35 minutes in the evening and 15 in the morning!